Mexican Tortilla Soup Recipes, especially the ones you’re served in some “Mexican” restaurants, (Read American Mexican) tend to be watery and disappointing. They don’t have to be! If you make this with a rich homemade stock, the soup is a meal in itself. But even canned stock makes a really good soup. You can serve this as a meal, or as a first course. But be sure to make extra, it’s so good people will want more! This recipe is an elaboration of a simple recipe in my what is considered by many to be the first and best book on Mexican cooking: The Complete Book of Mexican Cooking, by Elizabeth Lambert Ortiz. I don’t know if you can get the trade paperback that I know and love anymore, but there is a revised edition that I would get if I didn’t have the first edition: The New Complete Book of Mexican Cooking . 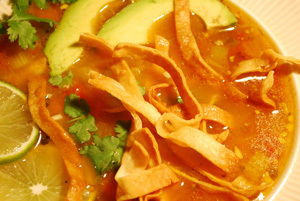 If you try this recipe, or have a favorite tortilla soup recipe, please let us know. Begin heating the stock in a large pot. Sauté the onion in 2 T oil until soft, add garlic and chiles and continue sautéing until garlic starts to become transparent. Add tomatoes and simmer 5 minutes or so. Stir tomato mixture into the stock and simmer 20-30 minutes. Add chicken or shrimp if desired. While soup is simmering, cut the tortillas into ¼ inch strips and fry on both sides in the oil until lightly brown and crisp. Drain on paper towels. Garnish with chopped cilantro, tortilla strips, avocado, a squeeze of lime, and cheese if desired.